As locals will tell you, Montreal’s winters can be brutal. So much so that the owner of this Plateau Mon Royal restaurant – a brisk stroll from the glam of Mile End and the green expanse of Mount Royal – wanted a place that transported diners to an entirely different, warmer clime. 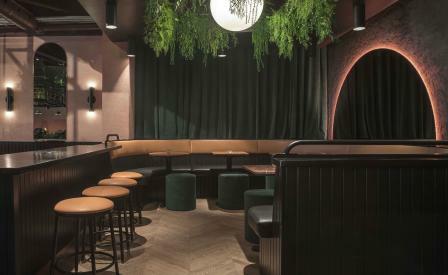 For local architects and interior designers Ivy Studio, this involved swaddling a former auto repair shop in cheerful pink lime plaster, draping wispy botanicals over the bar, and recalling sunsets with backlit smoked mirrors. Homage is also duly paid to the former occupants by way of original exposed steel girders which, through rusted lettering, still bear the palimpsest of the business sign. Behind an open galley kitchen lined with counter seats, chef Maxime Desjardins Tremblay works up a local, seasonal menu featuring an egalitarian spread of meat, vegan and vegetarian dishes. Crowd-pleasers include slabs of charred Wagyu and Angus beef, alongside ravioli stuffed with lobster, an explicit nod to nearby Little Italy.